We are pleased to announce that the catalog of the exhibition "Precious Instruments, Illustrious Names" has been published, which tells four centuries of violin making and collecting, music and musicians, nobility and patronage. Violins, violas, 5 orders guitars, mandolins, lyre-guitars, harps, hurdy-gurdy and salvers built by violin makers, recognized and appreciated all over the world: from Stradivari to Guarneri "del Gesù", from Amati to Guadagnini, from Vinaccia to Fabricatore, Berti, Battaglia, Nadermann, Torres and Hauser representing the main Italian and European protagonists of an artistic craftsmanship, violin making, which is inseparably linked to the culture of making music. Precious instruments that, exposed on the stage of the Royal Palace of Venaria Reale, transcend the simple object of artistic craftsmanship, to play roles of real works of art. Protagonists 30 precious musical instruments, mostly exhibited for the first time to the public, belonged to illustrious personalities: from famous musicians of the caliber of Gaetano Pugnani, Niccolò Paganini, Henry Vieuxtemps, Mauro Giuliani, Francesco Molino, Federico Cano, Ramon Montoya, Andrés Segovia, Ida Presti, to a series of important historical figures such as Emperor Leopold I of Habsburg, Empress Maria Teresa of Bourbon Naples, Princess Maria Teresa Strozzi, Count Cozio of Salabue, Duchess Maria Cristina of Bourbon Naples, the Countess Maria Beatrice Barbiano di Belgioioso, the Duchess Maria Teresa of Bourbon France, Queen Margherita di Savoia. 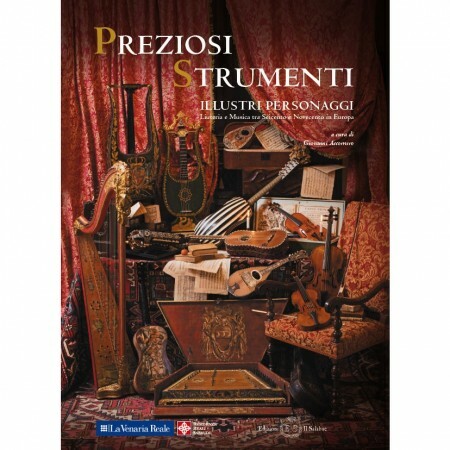 The quality of the instruments published, the quantity of color photographs and documents of the time, the details of the instruments, enrich a work of sure interest for violin makers, musicians, collectors and for the common public. Edition in 2 languages: Italian and English. 408 pages, 24x34 cm format, hardcover binding. 30 instruments, introductory essays, data sheets, comparative table of measures.